In this tutorial we will see about PowerShell Arithmetic Operators and how PowerShell is dealing with them. Some of the arithmetic operators are working also on string values. Below we will go through those operators with examples to understand their use. Below is the list of PowerShell arithemtic operators. - : Subtracts a value from another. Makes a number a negative number. * : Multiplies numbers. Copies strings and arrays by the specified number. / : Divides two values. -shl : Shifts bits to the left by the specified number of times. -shr : Shifts bits to the right by the specified number of times. Please note that all operations within your scripts will be performed in that order. You need to be careful when you are writing your expressions as it can affect the results. Lets see few examples of arithmetic operators. The above operators are easy to understand. Now lets see the rest of the operators and there results. They work the same with logical operators for binary numbers. I will give some examples and basic binary details on how this works but I will not go in to much details. Lets see the general rules for bits. The below examples will help you understand. The numbers that I will use are below including their binary format. There are times that we would like our results to be always an integer number. 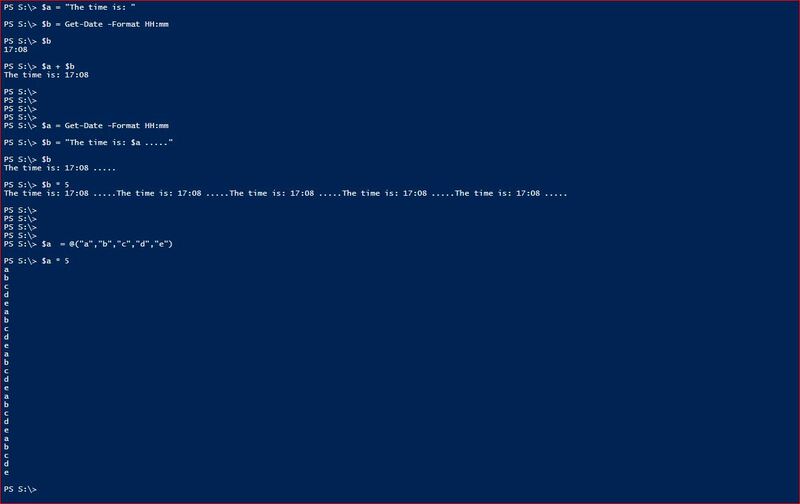 There is a way to perform this in PowerShell. In case the decimal in the result is 0.5, PowerShell rounds the number to the nearest even integer. The below examples will help you understand. Now lets see how addition ( + ) and multiplication ( * ) work with strings. I have used the below code for my examples. $a = "The time is: "
$b = "The time is: $a ....."
Note that you can combine not only plain string values using the ( + ) operator but also hash tables. You have to note though that if there is any conflict in the keys of the hashes then it will throw an error. You cannot combine 2 hashes that they include same key. I hope the tutorial about PowerShell Arithmetic Operators is helpful.